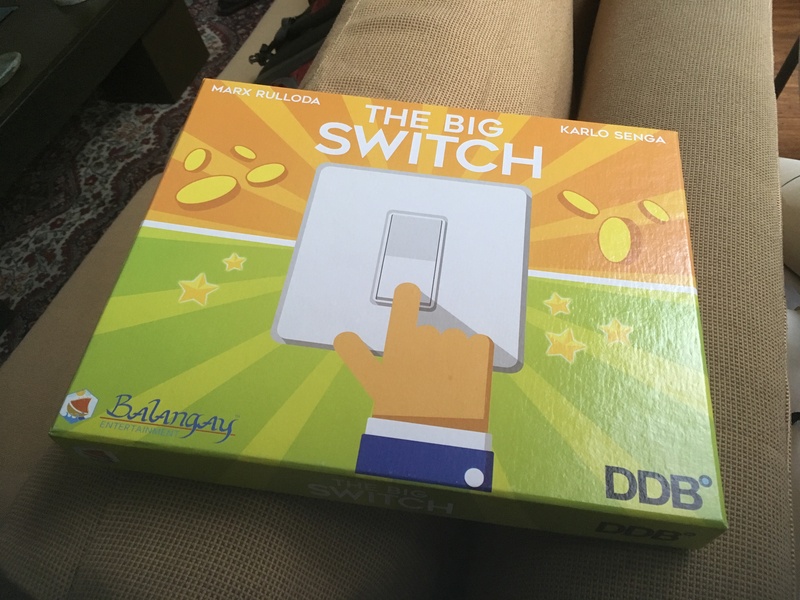 The Big Switch is a fun and frantic bidding and tile-flipping board game about saving electricity. Players compete in 20-second auctions to do energy-saving habits and to buy efficient appliances for their homes. The player with the most Energy Stars at the end of the game is the winner! Though it is an educational game, it’s still incredibly fun 🙂 Just ask the people who’ve been to an Unpub. Back then it was still known as Superstar: Bid, Save, Win! In the last 3 months, its theme was changed to make it more elegant and to have a clearer message. The Big Switch will be sold at P1,500 SRP. However, if you are part of an educational institution like a school or an NGO and will use it for educational purposes, you can avail of our 20% educational discount which brings the price to P1,200. Note: To avail of the educational discount, you have to sign a document that says you can’t resell the game. The game comes with a complimentary The Big Switch App which contains a timer and the different steps to setup and play the game. Though any device with a 20-sec timer (like a cellphone) will be enough to play the game, the app contains new harder game modes that you can’t do with a normal timer. We plan to upload the App to the App Store and Play Store next week. For now, you can access it at balangay.bitbucket.org though we will eventually migrate it to a permanent place once our own website is up. The second news is that, from now on, we will be posting regular game reviews but with a twist. There are a lot of game reviews out there that focus on how fun a game is and if it’s worth trying out. We wanted to do something different: we are going to be doing game reviews but from the perspective of a designer. We want to share with you how we look at games to try to pierce the veil of the designer’s mind and see what they were thinking as they made their design decisions. We will talk about game design principles, design tradeoffs, and the different things we’ve learned in our ongoing journey to become great game designers and developers. Ever wonder how game designers come up with all their ideas? What guides them in their design process? What were they thinking to come up with all those crazy fun mechanics? Karlo “2k” Senga, one of our game designers, will be reviewing games from the perspective of a game designer to shed light on the designer’s mindset during the design cycle. He will delve into the different mechanics in a game, the principles and ideas behind those mechanics, and what were the possible reasons why the designer made those design tradeoffs. For his first review, 2k will be looking at Pandemic: Reign of Cthulhu and be touching on the game design differences between that and the original Pandemic. Making the art for games is more than just making sure it looks pretty: it has to be functional and it has to compliment the game’s mechanics. Finding the balance between the two is no mean feat. Aaron “Aa” Galzote, our graphic artist, will be reviewing the art, aesthetics, and graphic design of games from the perspective of the graphic artist. As an exercise, he will also be exploring reskins of the games he’ll review to see how he would have done the aesthetics if he was the artist of the game’s development team. For his first review, Aa will be showing his review of Mascarade. At the moment we are working on many projects in parallel. Here’s some news on the projects we can talk about. However, we are still exploring doing improvements on the design. We’ve learned so much since we designed that game and want to apply what we’ve learned to make the game more elegant. For now, we had to prioritize our other games over Trese Case Files since they’re closer to being brought into the market. Once our other games are selling and we have more leg room to wiggle around, we’ll continue development on Trese Case Files. We apologize if the game will be delayed but we would rather move back the project than to rush it and release a mediocre game. Trese Case Files is our most ambitious project-to-date and we really want to give it the time for it to be the awesome game we envision it to be. Nico is a game designer, programmer, songwriter, ex-audio engineer, amateur fiction writer, and president of Balangay Entertainment®. One of the less competitive members of Balangay, Nico only wins against 2k, Marx, and Aya when he's played the game before and they haven't. Nico always wins against Aa. He'll play almost anything as long as it's not loud. He likes euro games for their strategy and thematic games for their roleplaying. He doesn't like party games that much because they get too noisy for his ear disability.